The arts can play an important role in a child’s development and are something that everybody and everyone should have access to. Engaging in arts and cultural activities from an early age can encourage us to think creatively, bring us into contact with people from all walks of life, improve our communication skills and our performance at school and are even proven to be good for our health and wellbeing (The All-Party Parliamentary Group can vouch for this!). One fantastic way to get a dose of the arts is to go and see some live theatre and luckily there are so many different ways for you to do this. At Prague Youth Theatre, we’ve started organising trips for our students and their families to see English language theatre in Prague because we think everybody should have the chance to experience the magic of live theatre. Here’s just some of the reasons why we think taking a trip to the theatre is so important and shouldn’t be something that feels scary to us or out of our comfort zones. Live theatre is for everyone and there are so many different ways that you can experience it. From the jam-packed programme of local and touring work at your local theatre, to the bustle of theatre festivals, outdoor and site-specific performances or even the excitement of live screenings from world-class theatres to your local cinema (Check out these National Theatre screenings at venues in Prague and beyond! ), there are a variety of ways to explore live performance. Theatre allows you to sit down, relax, take your mind of the stresses of everyday life and watch stories unfold in an environment that can be far more personal and engaging than watching a film as no performance is exactly the same. Theatre has the ability to shock, surprise, make you cry with laughter, inspire you to take risks or pursue new adventures and is a great way to connect with your family and friends. Through live theatre, we are exposed to multiple stories and characters that we can relate to but also get to know and understand. We’re transported into the minds of others, both heroes and villains, and encouraged to recognise other people’s feelings and emotions which in turn encourages us to be more empathetic and communicative individuals. Theatre is an exciting way to promote education and literacy and is also a useful tool for helping us when learning languages. Live theatre offers another platform to experience the language in action through interesting and engaging stories and entertainment. You won’t even realise that you are learning! Theatre gives us the unique opportunity to share experiences with fellow audience members and directly connect with artists all in the same space which can be a valuable way to experience human connection. Moreover, we may come into contact with characters who are going through similar situations who are able to demonstrate to us how they get through things. 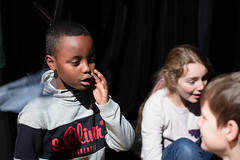 For budding actors, trips to the theatre are especially important for exploring the many possibilities that theatre offers. You’ll become familiar with how everything works in a professional environment but also be exposed to and inspired by the breadth and potential of a range of actors and performers. It’s also a great activity to experience with your fellow youth theatre chums as you can swap notes later and share your thoughts on the show for your own growth and development as a young actor. Looking for some theatre inspiration but not sure where to start? Prague Fringe is taking place between the 25th May and the 2nd June this year and there are plenty of exciting shows and events that should not be missed. We recommend that you check out Family Fringe on the 26th May (14:30-15:30) which gives a taster of the various shows for young people and families on offer at this year’s festival. Expect a showcase of comedy, clowning, puppetry and storytelling which are sure to get you you excited for the many family shows at the fringe this year and what’s more is that it is completely free! Next Post Prague Fringe 2018 : Day 1 Roundup!